The bees need you and we need the bees! Bees are import­ant pol­lin­at­ors and honey pro­du­cers; their num­bers are declin­ing. As part of the orch­ard pro­ject PEDAL are con­sid­er­ing keep­ing bee hives in the orch­ard. It would need a com­mit­ted group with,or to train to get, the skills to set up and look after the hives through the year.It could be a fas­cin­at­ing and reward­ing way to spend some time. This entry was posted in Food, gardening, Orchards. Bookmark the permalink. It is so a bee! Just not a hon­ey­bee (the kind you keep in hives to make honey). It’s a bumble­bee (the wild kind). 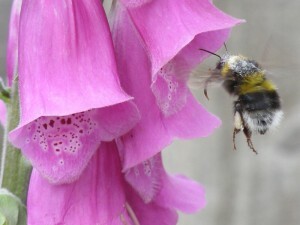 I know it’s the “wrong sort of bee” (as Pooh would say) but I like the pic­ture!